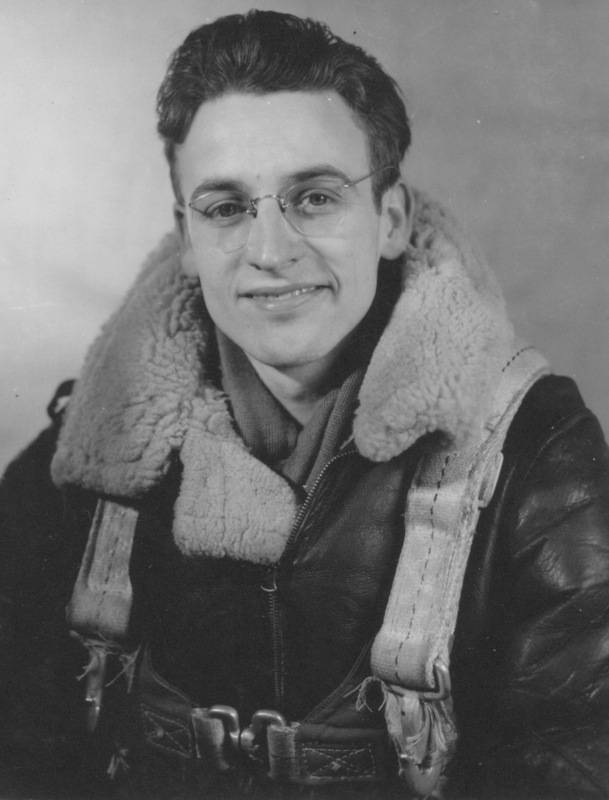 My father, Chaplain Lucas W. Buttry, served a career as an Air Force chaplain, his largest stretch with President Eisenhower as commander-in-chief. I couldn’t help but think of Dad again and again as we wandered the grounds and home of President Dwight D. Eisenhower’s farm Friday in Gettysburg, Pa. Both grew up in small Midwestern towns, then saw the world serving in the U.S. military. Both liked TV Westerns. Both avoided political partisanship (well, until Ike joined the Republicans and ran for president). Both enjoyed painting. Luke Buttry served in the Army Air Corps under Ike’s command in England during World War II. After going to college on the GI Bill and then graduating seminary, Dad served as an Air Force chaplain when Ike was commander-in-chief. 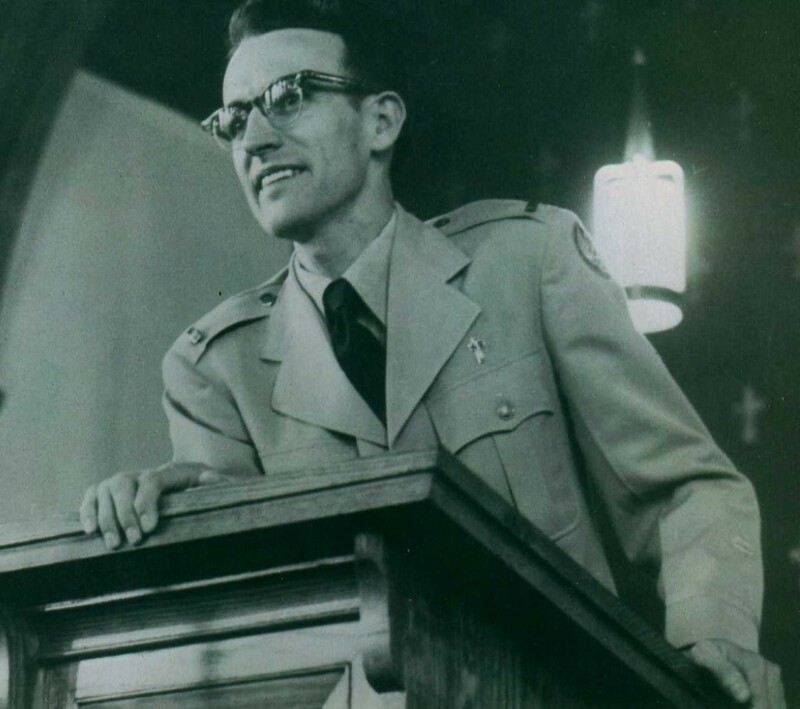 As a chaplain and later as a civilian minister, Dad was careful not to express political opinions or affiliations. He believed that ministers should preach the Gospel and minister to the needs of their people. Political affiliation would alienate people of whichever party he didn’t support, so Dad avoided taking sides. He was adept at making his sermons timely by addressing current issues without showing a consistent bias. Ike was a political independent as a general, wooed by both parties as a presidential candidate following World War II. Even when he became a Republican to run for president, he was easily the least partisan president of my lifetime. Though Dad didn’t discuss politics a lot at home, I knew he was more conservative than me. He and Mom avoided telling even their children how they voted, but I’m sure he voted for Eisenhower, and I’m pretty confident he considered Ike the best president of his lifetime, or second only to Franklin D. Roosevelt. Dad was born early in the Harding administration and died during the Carter administration. As we toured the Eisenhower National Historic Site, hearing anecdotes from Park Ranger John Joyce, I thought of the similarities again and again. Like Dad, Eisenhower enjoyed TV Westerns, his favorites being Dad’s faves: Bonanza and Gunsmoke. Joyce related that Khrushchev told Ike that Stalin had enjoyed Westerns. The Soviet leaders would watch Westerns together, and afterward Stalin would denounce the movie or TV show and the United States. And then they’d watch another Western the next night. (I should note here that Dad’s shared interests with Ike did not extend to the president’s favorite show, “I Love Lucy.” Dad was not a big slapstick fan. Well, unless it was military slapstick like “Gomer Pyle” or “McHale’s Navy.” We didn’t learn whether Ike liked the military sitcoms. Also no word on whether he liked Dad’s favorite TV drama, “12 O’Clock High,” which was about the kind of unit Dad served in under Ike’s command. Ike and Dad also liked to play cards more than their wives. Mamie couldn’t stand to play cards with Ike, Joyce said, because he was so competitive, and criticizer her plays. Dad attended strict Wheaton College, famous for its pledge, which covered traditional playing cards. For some reason, an exception was allowed for the game of Rook, so Wheatonites played Rook. Every time a couple from Wheaton visited, the Rook cards came out and Mom and Dad played with their visitors. I always thought they both enjoyed the game. But after Dad died, Mom confessed that she played only because Dad loved it. We never saw her play Rook again. 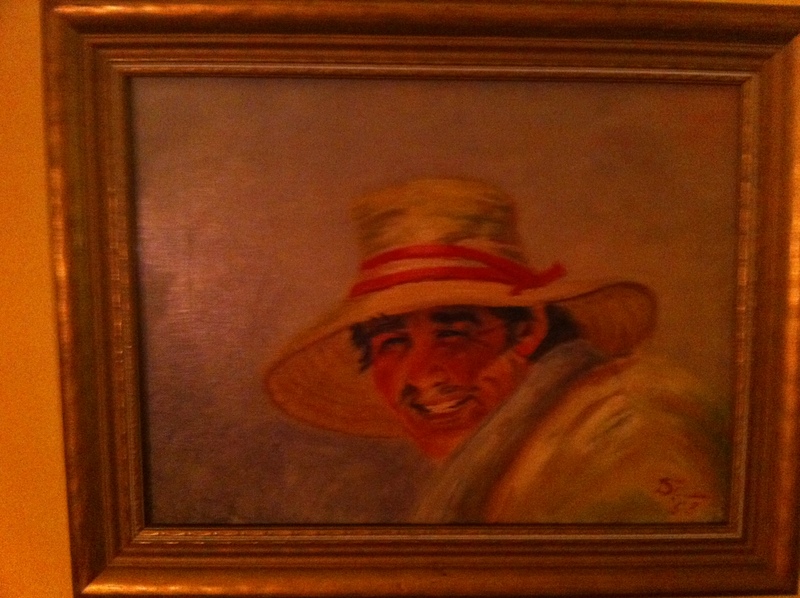 It was the painting, though, that most made me think of Dad. 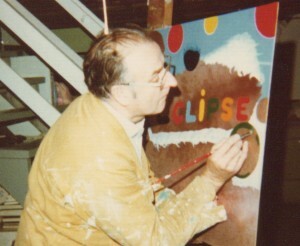 Both men took up painting as adults. Ike started when he was president of Columbia University between World War II and his White House years. Dad started when he was stationed in England in the late 1950s. After he nearly had a nervous breakdown, an Air Force doctor told Dad he needed a hobby to relieve stress, something completely unlike and unrelated to his ministry and military duties. Dad took an art class at the base hobby shop. While he didn’t take to the hobby immediately, a few years later, when we lived in Sunset, Utah, he apparently needed some stress relief and set up his easel in the back yard to paint a sunset as he watched the sun go down over the Great Salt Lake. Dad painted a lot of sunsets while we lived in Utah, and continued painting the rest of his life. I still treasure the sunset painting he gave me. He also branched out into making collages. A family history collage hangs in the hallway of our condo. 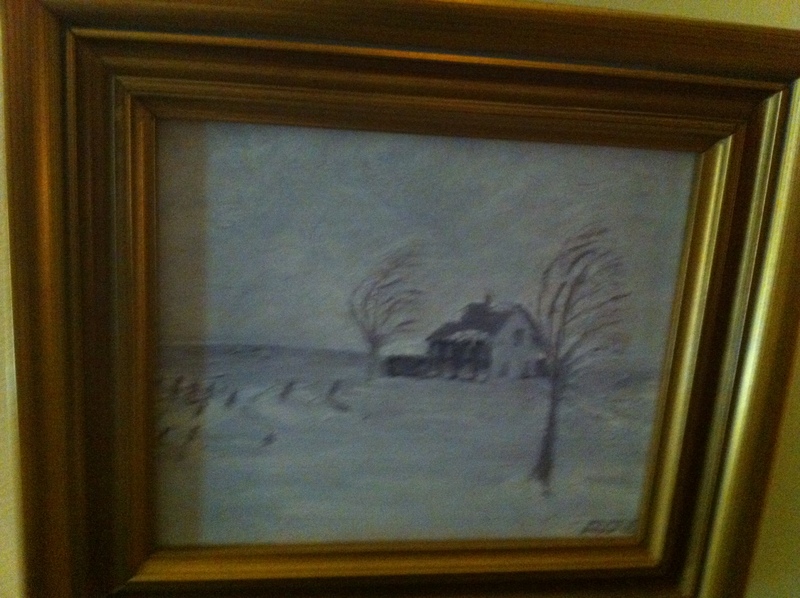 Like Dad, Ike painted mostly landscapes. 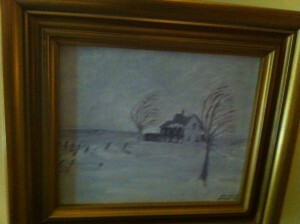 I saw two small country scenes hanging in his Gettysburg home: one featuring a church and a covered bridge, and another of a farmhouse on a windy day. Ike’s still-life paintings of flowers reminded me a bit of the simple style of Dad’s first painting, a still-life of fruit. 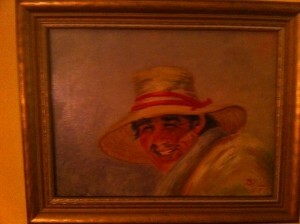 Ike’s best painting that we saw (Mamie’s favorite) was a portrait titled The Mexican. Dad couldn’t draw or paint people. Mom pushed him to do a self-portrait. He painted his favorite chair, empty but with his glass of milk sitting next to it. Dad said he had just gotten up to answer the phone. The men had their differences: Ike loved golf; I’m not sure Dad ever played. Ike liked gin; Dad stuck to his milk. Ike was a five-star general; Dad retired as a lieutenant colonel. But I’m pretty sure Dad liked Ike. And, after wandering his home and farm, I have no doubt Ike would have liked Dad. Dad died in 1978, nine years after Ike. It was 34 years ago this week, and the anniversary always brings him to the front of my mind. I used the photo at the top of this blog as my Facebook Timeline photo on Wednesday in his honor. But I think I would have thought of Dad whenever I might have toured Ike’s home. They were a lot alike. This entry was posted in Gettysburg and tagged Eisenhower, Luke Buttry by stevebuttry. Bookmark the permalink. Thanks Dad. Loved reading this with Julia. Thank you. What denomination ordained your father? His life is a recommendation. My earliest political memory was ringing a bell and wearing a sandwich board on the street in Shenandoah on Ike’s election day. I was 9. Ike represented an intelligent future free of the kind of war my parents had survived and hoped my brother could avoid. About a month ago my wife and my son and I trooped around Antietam with thoughts of another remarkable President who served during the bloodiest single day on American history. The consequences obtain to this day. Dad was an American Baptist minister (I think it was Northern Baptist when he was ordained, but changed to American Baptist during his chaplaincy).